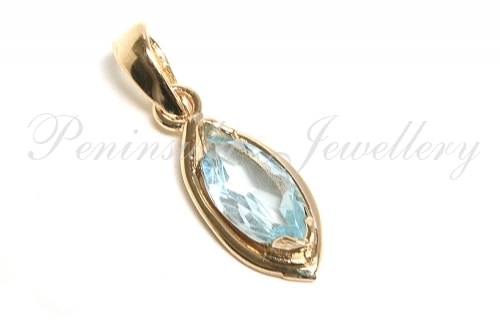 Simple yet elegant pendant featuring one 8x4mm Marquise cut natural Blue Topaz gemstone, tension set in a highly polished solid 9ct gold setting. Overall dimensions: 17mm long including bail, 5mm wide at the widest point. This pendant does NOT come with a chain. For pendants with chains, please see our shop. Supplied in a luxury gift box. Made in UK.